The friars of San Francesco in Assisi had a small hermitage here from the 13th century. 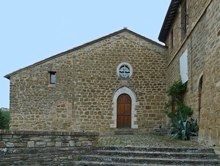 It was one of the hermitages that was given to the Blessed Paoluccio de' Trinci in in 1380, in the early days of the Franciscan reform movement. The friars returned to the Conventual Franciscans before 1464. The complex now belongs to the Comunità Adveniat Santa Maria in Arce. (Ring the bell for access to the church). ✴the semi-circular apse, behind the high altar. It contains a number of interesting works of art. 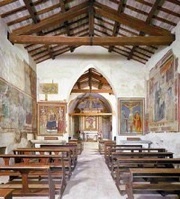 This damaged fresco on the right wall of the presbytery is attributed to the Maestro di Figline. This fresco on the right wall depicts the Madonna and Child with SS Francis and Clare. ✴the Presentation of Christ in the Temple. ✴a figures of St Antony Abbo, on the left wall. This painted crucifix above the apse is attributed to Matteo da Gualdo. This panel on the high altar, which depicts the Madonna and Child with SS Francis and Antony of Padua, is attributed to Giovanni di Pietro, lo Spagna.